Mike Wiegele’s heli-guides know a thing or two about testing fat skis. There’s an old fable by Aesop about the fox and the grapes. It goes something like this: A fox sees a vine heavy with grapes and leaps as high as he can but can’t quite reach them. He tries again and has no better luck the second time around. As he walks away, he says to himself, “They were probably sour anyway.” And the moral? It’s really easy to despise what you can’t have. I was feeling like that fox, and the non-stop barrage of epic powder shots, opening-day freshies and completely unbelievable snow reports were the grapes. I live in New Zealand, where it’s now summer, and it was a hard place to be when El Niño was creating some of the most epic early-season snow conditions in Western Canada’s recent memory. Checking Facebook was akin to some sort of medieval torture chamber, with friends posting pictures of first chair rides, untouched lines and tree limbs heavy with snow. So rather than despising what I can’t have, I’m choosing the high road. If there’s one thing that spending 14 years at the world’s best heli-ski operation gives you, it’s a solid understanding of the value of a great powder day, and that’s a feeling I hope every skier experiences in his or her lifetime. So that’s why Ski Canada returned to Mike Wiegele Helicopter Skiing in Blue River, B.C., to test the 2016 crop of powder skis. We want you prepped and El Niño ready, so when the snow report says there was 20 fresh overnight, you’ll have the right tools to get every grape on the vine. Go, fox, go! 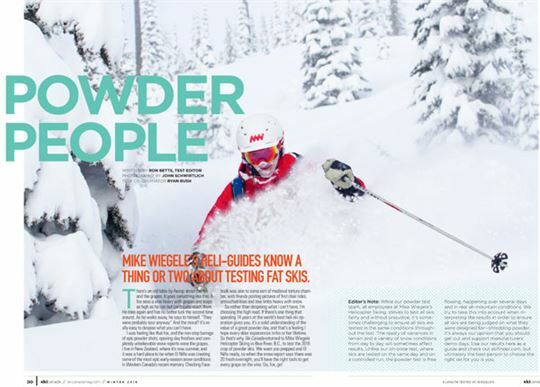 Editor’s Note: While our powder test team, all employees at Mike Wiegele’s Helicopter Skiing, strives to test all skis fairly and without prejudice, it’s sometimes challenging to ensure all skis are tested in the same conditions throughout the test. The reality of variances in terrain and a variety of snow conditions from day to day will sometimes affect results. Unlike our on-piste test, where skis are tested on the same day and on a controlled run, the powder test is free flowing, happening over several days and in real all-mountain conditions. 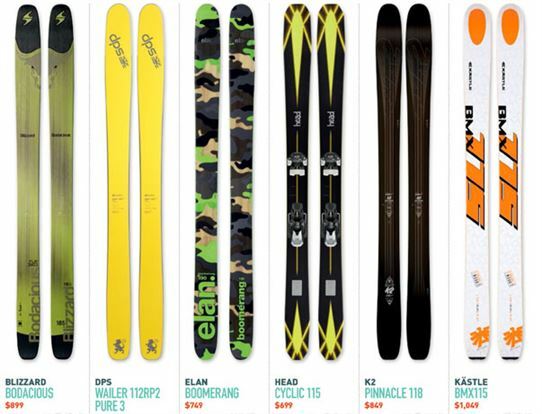 We try to take this into account when interpreting the results in order to ensure all skis are being judged on what they were designed for—shredding powder. It’s always our opinion that you should get out and support manufacturers’ demo days. 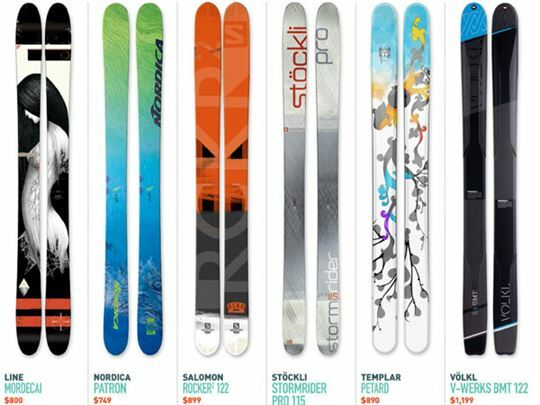 Use our results here as a guide and check out skifinder.com, but ultimately the best person to choose the right ski for you is you.